The 13-year-reign of the Workers' Party in Brazil hangs by a thread. Once the pride of the New Left in Latin America, the government led by Rousseff’s Workers’ Party -- known by its Portuguese initials, PT, for short -- has been buffeted by the worst economic crisis to hit Brazil since the country's re-democratization in 1985. It’s been further hobbled by charges of abetting corruption at the state petroleum company, falsifying its electoral spending reports, and going back on its electoral campaign pledges by imposing austerity measures. In 2010, President Luiz Inácio “Lula” da Silva -- a founding member of the party -- left office with an 83 percent approval rating, something unprecedented in Brazilian history for a departing head of state. Today, his approval rating is down to 25 percent. Rousseff, his successor, won her second presidential mandate in October 2014 with 52 percent of the vote. Just a year later, her approval rating is down to 7 per cent. Demonstrations involving thousands have backed the opposition's call for her impeachment, with a fringe but vocal element calling for a return to military rule. PT partisans and the broader left are not so much worried about these rallies, which have been mounted by what they consider an angry but unorganized public. What really concerns them is the smaller numbers that have attended counter-demonstrations against what they’re calling an antidemocratic coup against elected PT rule. Not surprisingly, members and allies of the party are asking themselves: What happened to us? PT programs lifted more than 30 percent of the Brazilian people out of poverty and 40 percent into the middle class. Don't people realize this? Why, some partisans wonder, aren’t they more grateful? In its beginnings, the PT was organically linked to the “New Unionism” that developed in the industrial belt of greater São Paulo. According to Emir Sader's classic analysis, the party was a dynamic new force produced by the creative confluence of three streams: independent trade unionists, the progressive wing of Catholic clergy and laity inspired by liberation theology, and the new left with its reinvigorated Marxism and enthusiastic young cadres. By the mid-1980s, the PT -- along with the New Unionists and the Landless Workers Movement -- was among the largest and best-known social forces pushing for the expansion of democratic space and a vision of a socialist Brazil. The PT's pluralism was key to its growth and electoral appeal. In the 1980s and 1990s, the allure of the PT's open discourse reached beyond the working classes to attract middle-class supporters wearied by years of dictatorship. Dynamic and ambitious, the PT sought nothing less than the presidency, which Lula managed to win in 2002 after several failed attempts. The infrastructure for that national effort was laid by the PT's successes at winning and administering cities and states. Thus, even before it came to power at the national level, the PT had already made its mark as a party against corruption at the local level and with innovative policies, like the participatory budgeting that was successfully institutionalized in the city of Porto Alegre. Social movements allied to the PT were also prominent in the international anti-globalization movement that took off in the 1990s and were the central actors in the founding of the World Social Forum -- which, among other things, became a vehicle for the popularization internationally of innovations like social movement unionism and participatory budgeting. Brazil's electoral system encourages the proliferation of multiple, weak parties. Although it was the top performer in both legislative houses following the 2002 elections, the PT held only 17 and 18 percent of the upper and lower houses, respectively. PT operators promptly got the party in trouble in their attempts to bribe non-PT members of the Brazilian Congress to allow the passage of PT legislation benefiting the poor and marginalized. Though Lula was not accused of having a hand in the bribery, this scandal at the beginning of his term might be said to mark the beginning of the erosion of the PT's image as a clean party. In later years, the PT accepted corruption-tainted candidates in order to try to maintain its numbers in the legislature. Brazil's mainstream media has also been a major contributor to the erosion of the party's clean image. Brazilian media is an effective monopoly, with the Globo network reaching 99.5 percent market saturation. Globo has been widely criticized for its biased coverage against the PT, including exaggerating coverage of corruption allegations when PT members are involved and editing scandal and corruption coverage to imply the involvement of PT personalities without directly accusing them. Perhaps most tragic, though, has been the deterioration of grassroots organization on behalf of both the PT and allied social movements. Starting around 2005, the PT stopped organizing núcleos de base, the basic units of party organization. Iole Iliada, the PT's secretary for international relations, considers this a major setback to party life, owing to the virtual elimination of the ideological and political debate that once took place in the núcleos, as well as the disappearance of the vision of a bottom-up, participatory party. Social movements also slowed their organizing following Lula's election. Various activists, from labor unions to urban housing and service movements, admitted that many movements lost their vigor, adopting instead a “wait and see” attitude. As João Stedile, a leader of the Landless Workers' Movement said in a 2007 interview, “We thought that a simple electoral victory would give a shock to the masses… We thought this was it, the time had come! And it hadn't. It was really frustrating. Rather, the Lula years were marked by the implementation of orthodox foreign investment, trade, fiscal, and monetary policies -- indeed so orthodox that the neoliberal Economist toasted Lula's policies as providing a model for other big “emerging markets.” Yet those years also saw declining poverty, despite the absence of the redistributive measures that both business and labor had expected the PT to put into effect. In a long, illuminating article in the London Review of Books, Marxist analyst Perry Anderson concluded that Lula's innovation was to combine conservative macroeconomic policy and foreign-investment-friendly policies with an anti-poverty program, the Bolsa Familia, that cost relatively little in terms of government outlays but produced socially and politically significant impacts. Bolsa, a program of cash transfers conditioned on parents keeping the family children in school and subjecting them to periodic health checkups, by some estimates contributed to the reduction in the number of poor Brazilians from 50 million to 30 million -- and made Lula one of the few contemporary political leaders who was more popular at the end of his reign than at the beginning. The first decade of the 21st century was marked by a rapid expansion of trade that benefited large emerging markets like Brazil, which grew by an average of 5 percent a year between 2000 and 2012. Rapid growth meant that even with minimal redistributive policies, people's incomes increased. Lula had the good fortune of being president at a time of a global commodities boom, which also provided the resources that allowed Brazil to weather and then delay the effects of the 2008 financial crisis. Along with China, India, Russia, and South Africa, Brazil became part of the so-called BRICS, a group of big emerging markets that were primed to become key drivers of the world economy. The PT government's representatives played a key role in advancing the BRICS as well as other developing countries' agendas in the World Trade Organization, International Monetary Fund, and the United Nations. 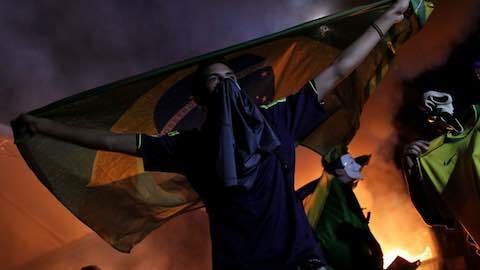 While there were protests throughout the first 10 years of the PT's reign, the first really massive protests exploded in the run-up to the World Cup. The abandonment of basic organizing by both the PT and leftist social movements left a vacuum that steadily came to be occupied by right-wing forces. The rise of evangelical churches -- whose membership saw an increase of 61 percent between 2000 and 2010, according to government statistics -- and an attendant influx of evangelical lawmakers in the national legislature has brought a resurgence of conservative social values that directly contend with the progressive identity politics of the PT and social movement militants. Rightist and opportunistic parties such as the Social Democratic Party of Brazil (PSDB) and the PMDB have taken advantage of the social frustration fomented by these churches, as well as their grassroots organizations, to rally discontent with PT rule. While tension has been building since Brazil's economy began shrinking in 2011, a major opportunity for the right came in 2014, when the Petrobras scandal broke out. Over 50 members of Congress and the Workers' Party -- including its national treasurer -- were implicated in a massive $3.7 billion kickback scandal at the state-owned oil company. While Rousseff has not been directly implicated in the affair, she was, in fact, head of the Ministry of Energy that oversaw Petrobras at the time of the kickbacks. Expectations that she’d prioritize keeping unemployment low, focusing on growth, and maintaining social programs benefiting the poor were punctured by her decision to raise interest rates just three days after the elections and to appoint Joaquim Levy, an aggressive fiscal conservative popularly known as “Mr. Scissorhands,” as finance minister. The rural lower classes were also affronted by the appointment as minister of agriculture of Katia Abreu, a senator known as a fierce defender of landowning interests who had displayed such disregard for the environment that she received Greenpeace's “Golden Chainsaw” award. The appointments of “Mr. Scissorhands” and “Mrs. Chainsaw” were seen as a strong indication that Rousseff endorsed the neoliberal view that the way out of Brazil's current recession lay in a strategy of cutting government costs while intensifying Brazil's export drive, particularly of agricultural products like soybeans and sugarcane. Neither these appointments, nor the government's fiscal austerity program, were decided in consultation with the PT membership. By 2011, however, the global recession caught up with Brazil, with the economy growing by only 1.3 percent annually over the last four years -- compared to 4-5 percent during the Lula period. This year Brazil is in recession, while inflation has reached a 12-year high. Once one of the key beneficiaries of capitalist globalization over the last three decades, Brazil has now become a prime victim as the downside of that process -- global contraction and long-term stagnation -- has taken hold. With massive opposition-inspired protests, the Rousseff administration's survival depends greatly on the moves of its supposed allies in the non-ideological PMDB. Wooed by the opposition PSDB to support its initiative to impeach the president, the PMDB, opportunistic as usual, is weighing whether to stick with Rousseff in return for more positions or to join the impeachment drive, which might have an even bigger payoff. Two things are giving it pause. The first is that although the PMDB president of the lower house, Eduardo Cunha, has openly split with the government and portrays himself as Dilma's “archenemy,” he himself is politically vulnerable. In addition to being implicated in the Petrobras scandal, Cunha is currently facing money laundering charges by both Brazilian and Swiss government prosecutors in relation to several bank accounts discovered by the Swiss government and previously undisclosed to the Brazilian government. The Brazilian attorney general alleges that the $16 million found in Cunha’s Swiss accounts was made off bribes and partially laundered through an evangelical megachurch before ending up in Switzerland. Pushing for Rousseff’s impeachment, Cunha fears, might provoke a fierce PT response that could threaten his own position. The second is that the pro-impeachment lobby can't make up its mind on whether to push for impeachment now or postpone it till later in Rousseff’s administration. The rationale for the second strategy, which might be called dealing the president a “death by a thousand cuts,” is to get the PT government to make more social cuts and take the flak for them, with the strategic aim of discrediting Lula himself -- who’s expected to run again for president in 2018 and whose charisma cannot be underestimated. For a Just and Democratic Brazil -- a study put out by the party's Perseu Abramo Foundation based on consultations with over 100 economists and analysts -- lays the blame for Brazil’s economic crisis principally on the international crisis, rather than on the party’s policies. Since it was based on the wrong diagnosis, the adjustment program pushed by Rousseff’s government and personified in Levy has merely worsened the situation, the report concludes, “reducing aggregate demand, blocking growth, and incurring social costs.” The document claims that half a year into the second Rousseff term, the fiscal retrenchment strategy raised unemployment to 7.5 percent in July, compared to 4.9 percent a year earlier -- a drop that represents the loss of nearly 500,000 formal sector jobs. In May alone, the PT study claims, average real income fell by 5 percent. When the party gained power and, in some places, prioritized winning seats over recruiting quality candidates over the last 15 years, party cadres got absorbed into government, party life ossified, and ideological debates on key issues were overshadowed by pragmatic accommodations with capitalism. For some, regaining the party's early identity and vigor as an anti-capitalist force linked to an insurgent labor movement and a dynamic civil society is the real answer to the PT's troubles. In order to do this, the party faces the puzzling predicament of shaping a new generation of anti-establishment militants when it’s been the face of the state for over a decade. Latin America: "The Rise and Fall of Latin America's Most Successful Progressive Party"